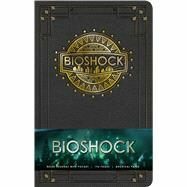 Experience the dystopian world of BioShock with this finely crafted journal showcasing iconic imagery and brilliant concept art from the game. Since the original game’s debut in 2007, the BioShock series has engaged a legion of fans with incredible worlds, complex characters, dynamic storylines, and exceptional graphics. The first atmospheric game introduced players to Rapture, a city at the bottom of the ocean where the only creatures that dare to roam are the Little Sisters and their Big Daddy protectors. Featuring images and concept art from the first BioShock game, this journal offers players the chance to record their own journeys and adventures.